How to Go Mobile on WordPress! With the widespread adoption of smartphones and tablets the mobile visits to your website are exploding. Last year in May 2010 our site had 0.6 percent of mobile visitors. Now a year later the number has grown more than 7 times and getting close to 5 percent of total website visits. If you have a WordPress site then you can set up the mobile version in a few minutes. Behavior of out mobile visitors is somewhat different from desktop users. Majority of mobile visitors arrive at our site as direct traffic. But I believe that most of that is from mobile social media clients and that’s why I suggest tagging links that you post to social media channels. In general mobile visitors spend less time on the site and visit 13 percent less pages. Some of that may be related to the fact that we didn’t have a mobile version of our site. 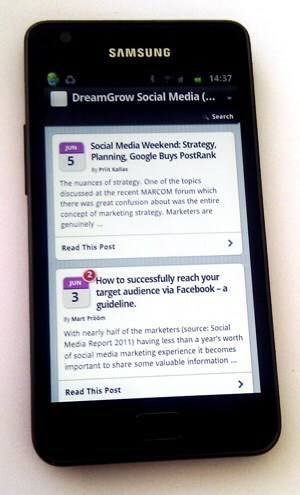 Now we have set up a mobile version with WordPress plugin WPtouch. WPtouch serves all mobile visitors a trimmed down version of the site. However, if you prefer normal site then you can switch to it using a button in the footer of the site (this works well for people with tablets that have bigger screens than smartphones). Stats show that more than 70 percent of the mobile visitors use iPhone or iPad. Percentage of mobile users on dreamgrow.com May 2010 to May 2011. Mobile users, please let us know what do you think: mobile version, regular or something completely different? We will gather some data with the mobile version of the site and let you know what changed.